Tampa is a tropical city located on the western coast or Suncoast in the center of Florida. The Port of Tampa consists out of 3 terminals, located in the Channelside district of the city. Book now the best deals for pre and post cruise hotels, cheap motels near Tampa cruise ship terminals. 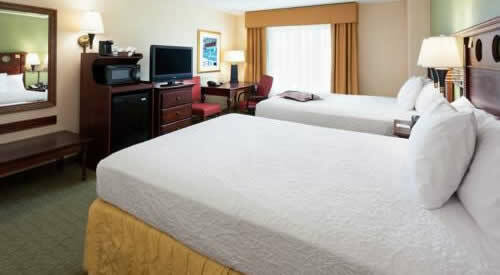 Overnight stay nearby the terminal, in downtown, Ybor, Busch Gardens, close to the airport (Westshore area). Some properties provide free parking, breakfast and shuttle service. Hotels near Passenger Port of Tampa in Florida – Where to Stay ? There are many hotels within close distance of the port in the downtown area and Ybor entertainment district. Some are only a few blocks away and offer you a free shuttle to the port and free breakfast. Downtown hotels are either on or very near the trolley line which takes you around the city. These hotels are very close to the port so a taxi is just a few $. Ybor has great restaurants, nightlife and some really good Cuban ethnic eateries. Many budget-friendly properties can be found in the Westshore area (near TPA airport). Free airport shuttles is offered by many hotels. Some will take you to the cruise port as well. Westshore is about 4-5 miles from the ship terminals. Hotel prices are somewhat cheaper around the airport, Westshore and Rocky Point area than in downtown or Ybor City. Budget friendly property located in the historical Ybor City. 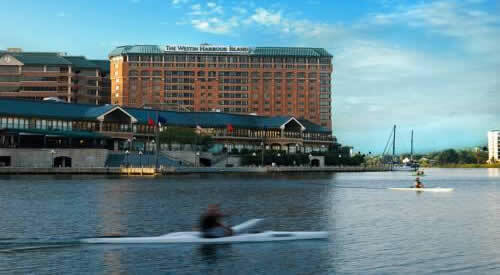 Waterfront hotel overlooking Tampa harbor, close distance of the cruise port terminal. 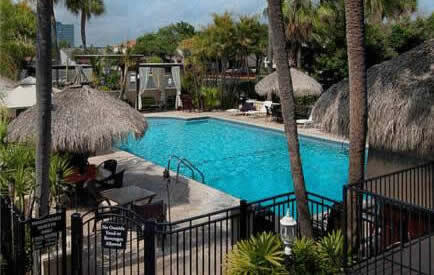 Discount hotel located between the airport and downtown/cruise terminal Port of Tampa fl. Free Parking. The Port of Tampa consists out of 3 terminals, located in the Channelside district of the city. Terminal 2 is home to Carnival Cruises, terminal 3 is used by Royal Caribbean (RCL) and Norwegian Cruise Line (NCL). Terminal 6 is home to HAL, Holland America Line. Tampa is one of the premier embarkation cruise ports in the United States. A number of different cruise lines operate from the Port of Tampa such as Carnival Cruises, Holland America Line (HAL), Norwegian (NCL) and Royal Caribbean International (RCL). Cruises depart from either of 3 passenger terminals, located in the city’s Channelside district. The Port of Tampa is the largest within the state of Florida and is a major gateway for cargo container and tanker ships. It’s also a popular embarkation or disembarkation point for cruises to the wonders of the Mayan ruins in Mexico and the Western Caribbean. We offer you a variety of hotels and motels in downtown Tampa, near the airport or right next to the cruise ship terminals. Check also other Florida cruise port hotels. Hotel near Port Canaveral, Port of Miami Cheap Hotels and places to stay in Ft Lauderdale close to port Everglades. Many offer a free shuttle transport. Cruise Passenger Terminals 2, 3 and 6 — the Port of Tampa consists out of 3 state of the art passenger terminals. Cruise Terminal 2, Seaport Street Terminal at Berths 271, 272, 273, is located on 651 Channelside Drive near Channelside Bay Plaza, adjacent to the Florida Aquarium. It’s primary used by Carnival Cruises. Cruises from Terminal 3 (Berth 269) are mainly operated by Royal Caribbean International and Norwegian Cruise Line (NCL). Both Florida Aquarium and Channelside Bay Plaza are within wallking distance. Terminal 6 at berth 266, 267 and 268 is used by Holland America Line. Tampa International Airport — the international airport TPA is located about 5 miles from the downtown area and 10 miles from the cruise port. Tampa airport is served by taxis, as well as several shuttle bus services available 24 hours a day (Bay Shuttle and SuperShuttle). Parking — safe and secure car parks are located just minutes from the Port of Tampa. The Tampa Port Authority has 3,480 parking spaces available to the public, 2,519 covered parking spaces and 1,316 uncovered parking spaces. The parking garage is located at 810 Channelside Drive, across the street from Terminal 3. Free round-trip shuttle service is offered to and from your departure gate. Valet parking is possible. They will take your car from the spot where you drop off your luggage and park it for you. Additional Channelside Bay Plaza parking garage, which is located across the street, offers safe and affordable indoor parking. Tampa is a tropical city located on the western coast or Suncoast in the center of Florida. Tampa is an entertainment city with several amusement parks, world class shopping and unique museums. Nearby attractions include The Florida Aquarium in downtown Tampa where you have the opportunity to learn and explore marine life in its natural habitat. Experience up-close encounters with amazing animals from Florida, take a boat trip to look for dolphins in the bay or even dive with sharks. Take a streetcar ride to the Channelside area, close to the cruise terminals, home to a number of excellent shops and some great restaurants. History lovers can take a look at the Tampa Bay History Center, a state of the art interactive museum at the waterfront displaying Florida’s 12,000 years of history. The Museum of Science & Industry (MOSI) houses the Saunders Planeterium and MOSI’s IMAX Dome Theatre. Enjoy an evening show at The Straz Center for the Performing Arts, or visit Ybor city, the historic Cuban or Latin District of Tampa. Stroll along the brick-lined walkways, have a cup of Cuban coffee at one of the coffee houses or check out a collection of cigars at a Tobacco shop. The neighborhood has been designated as a National Historic Landmark District, and is also famous for its vibrant nightlife and club scene. Beyond the city — nearby St Petersburg houses the largest collection of Dali’s work outside of Spain at the famous Salvador Dali Museum. Beach enthusiasts will love the powdery white beaches of St. Petersburg, in nearby Clearwater Beach and Sarasota. Go fishing, go sailing, take a kayak trip, rental a jet ski, enjoy dolphin and sunset tours, go parasailing or just relax on the beach. A fun day out for families with kids is Busch Gardens Tampa, a 330-acre zoo and theme park. Discover the animals from Africa during a fun train ride, or enjoy the rides and thrills. Pre or Post cruise lodging with (free) airport and shuttle service to the pier — some hotels offer a complimentary transport shuttle service to/and from the airport, and to the cruise ship terminals. Hotels are located a few blocks away from the port or TPA international airport. Extend your cruise vacation and stay at a beachfront hotel. Beach enthusiasts will love the white sandy beaches of St Petersburg, Sarasosta and Clearwater Beach. Popular is also a visit to nearby Busch Gardens and Adventure Land. Why not extend you cruise vacation in Orlando not far from Walt Disney World, Universal Studios or SeaWorld. Orlando is 85 miles away from downtown Tampa fl..